I discovered the following interesting account of colonial era Ocracoke & Hatteras islanders on several Internet sites. I have not located any reference to a primary source. However, Rev. John Urmstone's presence in Bath in 1710 is well documented. So, I hope you enjoy this short assessment of the character of some of the first Europeans on the Outer Banks. "In 1710, the Reverend John Irmstone [John Urmstone, a missionary of the Society for the Propagation of the Gospel in Foreign Parts, which was established in 1701 by the Church of England] of Bath wrote in a letter to his superior about people from Hatteras and Ocracoke who came to get baptized. He gives no surnames, but says, 'these persons, half indian [sic] and half English, are an offense to my own and I gravely doubt the Kingdom of Heaven was designed to accomodate [sic] such. They stunk and their condition was not improved by the amounts of sacramental wine they lapped up nor by sprinkling with baptismal waters.'" So much for the "propagation of the gospel!" Our latest Ocracoke Newsletter is a 1921 letter written by a former slave, Harrison Williams, to Ocracoke native, Martha Ann Howard Wahab. You can read it here: http://www.villagecraftsmen.com/news112113.htm. If you are on the island be sure to stop by Books to be Red between 3 and 5 pm. Ann Ehringhaus will be there to sign her new book, Ten Thousand Breakfasts, about 30 years in the Bed & Breakfast life at Oscar's. They will be serving warm tea on this cold November day. Tonight at 8 pm Molasses Creek will perform at Deepwater Theater on School Road. Come on out and experience a bit of Ocracoke in the off-season! All of us at Village Craftsmen send warm wishes to our readers for a Very Happy Thanksgiving filled with all good things. If you are on the island, come on out and join Ocracoke Alive for an evening of Ocracoke squaredancing, desserts, and celebration as this island non-profit wraps up the year and thanks all of the folks who helped make 2013 such a success. On Friday evening Molasses Creek will present a concert at Deepwater Theater on School Road at 8:00 PM. Winter on Ocracoke is a time to celebrate community. Quite a lot is happening in December, as you can see from the list below. Mark your calendar now so you don't miss any of these events. Last week I accompanied Capt. Rob, Hunter, and Steve on the Wilma Lee. We were taking her to Wanchese, NC for a routine Coast Guard inspection. We were motoring in fog for much of the trip; in heavy fog as we approached a particularly treacherous narrow & shallow area near Oregon Inlet, appropriately called Hell's Gate. "During a two-week period in late November , no less than eight commercial and recreational vessels ran aground in an area of the inlet known as Hell's Gate." (http://www.ncwaterman.com/article.asp?id=1244). Then we hoisted Rob up the mast in the bosun's chair so he could attach a becket high enough to be above the pivot point. After the mast was removed, the Wilma Lee was hauled out of the water for a hull inspection. Our latest Ocracoke Newsletter is a 1921 letter from a former slave to Ocracoke Native Martha Ann Howard Wahab. You can read it here: http://www.villagecraftsmen.com/news112113.htm. Starting today Village Craftsmen is offering a flat rate shipping fee of only $5.00 for any order shipped by ground (UPS or USPS) through December 31, 2013. 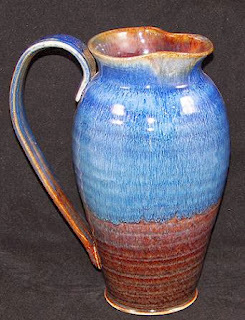 Click here to go directly to our on-line catalog, and select unique, hand crafted American made gifts for the holiday season: http://www.villagecraftsmen.com/catalog.htm. Several days ago I posted a photo of Frazier Peele's mid-1950s wooden ferry. Shortly afterwards I located today's picture in a box of papers and documents. I copied it from an original photo that I found in the Ocracoke Preservation Society's collection. 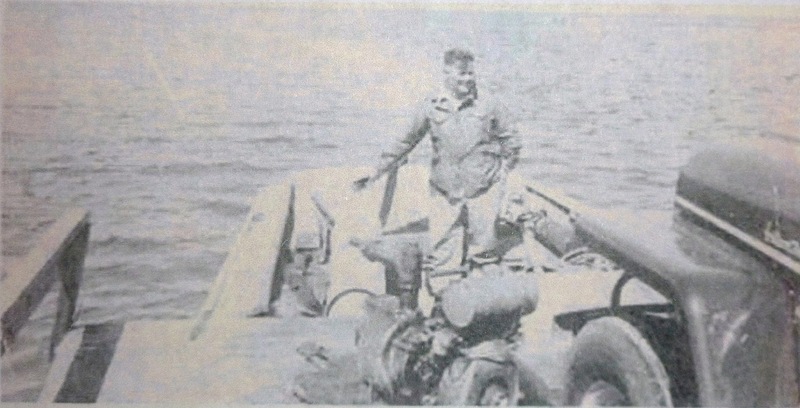 This is Frazier at the tiller of his earlier ferry, a wooden boat with planks nailed across the gunwales to serve as a vehicle deck. Some of our readers may have heard me share the story of crossing Hatteras Inlet with my parents in 1950. I was just six years old, and the entire experience made quite an impression! Even though I remembered two skiffs lashed together, and no railing (I see now that there was only one boat, and there were very basic low railings on the sides), I know there was no ramp. Two sturdy planks were simply spaced the proper distance apart, and the driver slowly and cautiously maneuvered his vehicle onto the tiny deck. Today marks the 295th anniversary of the death of Edward Teach. On this date in 1718 (according to the Julian calendar) Lt. Robert Maynard of the British Royal Navy engaged Blackbeard in a naval battle just offshore of Springer's Point on Ocracoke Island. At the conclusion of fierce hand-to-hand combat Blackbeard finally succumbed after receiving 20 wounds from swords and 5 wounds from pistols. 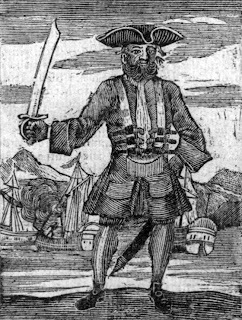 His head was severed from his body and carried to various ports in North Carolina and Virginia as a grim message to other buccaneers. This epic battle is often portrayed as the beginning of the end of the "Golden Age of Piracy." We have just published our latest Ocracoke Newsletter. It is a transcript of a 1921 letter written by Harrison Williams who was born into slavery in 1838 somewhere in the South. 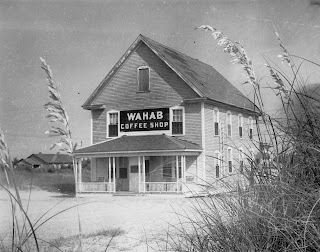 In the late 1800s Mr. Williams found his way to Ocracoke Island and made many friends here. 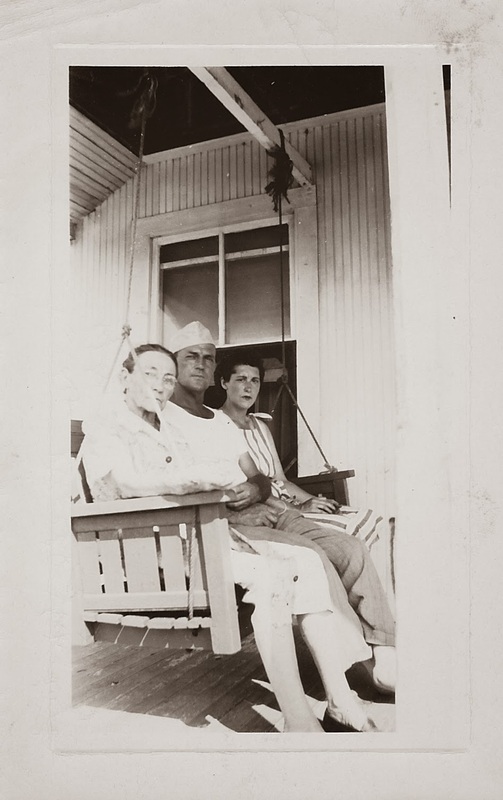 In his letter to Martha Ann Howard Wahab Harrison Williams recalls friendly neighbors and other fond memories of his time on Ocracoke. 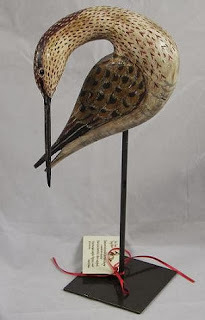 You can read our Newsletter here: http://www.villagecraftsmen.com/news112113.htm. This photo was taken about 1955, just as we were about to board the Hatteras Inlet ferry. 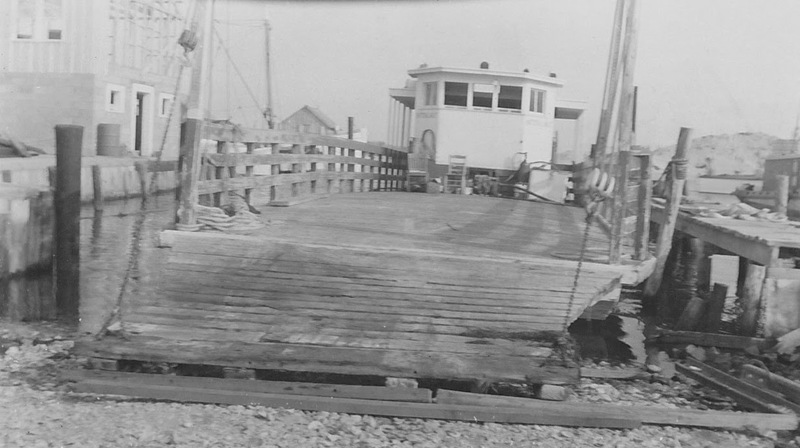 The ferry was owned and operated by Hatteras Island native, Frazier Peele. 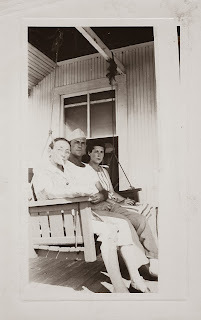 You can read about the Peele family, and see more vintage photos, here: http://www.hatterasgear.com/oldhatte.html. Our latest Ocracoke Newsletter is a brief history of the Soundfront Inn, one of the oldest structures on the island. You can read it here: http://www.villagecraftsmen.com/news102113.htm. Seven historic homes on Howard Street will be open for viewing during this year’s event. Have you ever wandered down Howard Street and longed for a peek inside the weathered old cottages? Now’s your chance! Join us Saturday, December 7th on Ocracoke for the Holiday Historic Home Tour. All the houses featured this year are located on Howard Street and will be available to view from 4 – 6 pm. Under live oaks and cedars, among old family cemeteries and picket fences, you’ll find the houses of historic Howard Street. These homes will be decked out in their Christmas finery, and their doors thrown open for guests to enjoy. Enjoy old-fashioned village hospitality as you step inside these island sentinels from centuries past. Satisfy your curiosity about these small and sturdy homes along the sand and shell-strewn path. Purchase or reserve your tickets for this event at the OPS Museum in person, or by calling 252-928-7375. Ticket prices are $15 for non-members and $12 for OPS members. Each of the houses on the Historic Home Tour is on the National Register of Historic Places, and is a contributing structure in Ocracoke Village’s National Historic District. Ocracoke United Methodist Church will also be open for viewing. Amy Howard, executive director of OPS, is excited to revive the Historic Home Tour that’s been on hiatus since 2003. As this becomes an annual event, Amy plans to focus on a different section of the Historic District each year. Except for the Methodist Church, the houses are all privately owned. Their owners are graciously opening their homes for Home Tour participants. There’ll be refreshments, too! 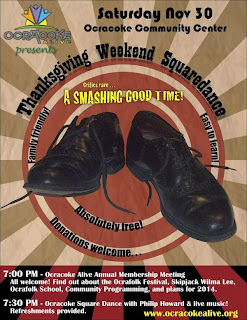 Ticket sales will benefit Ocracoke Preservation Society. The Ocracoke Working Watermen’s Exhibit in the Community Square will host a free Open House on the same day, from 4 ­– 6pm. The exhibit will welcome visitors with hot wassail punch and holiday goodies. The OPS Museum Gift Shop will be open until 4pm to sell Home Tour tickets and accommodate holiday shoppers. Other businesses will be open in the village – along with your Historic Home Tour ticket, you’ll receive a village map with open shops and restaurants clearly marked. Consider making a weekend of it, and join us Friday, December 6th for a Christmas choral concert at Ocracoke United Methodist Church at 7:30pm. Public Radio East’s classical music host, Finley Woolston, will direct his Joyful Band of Singers in this free holiday event sponsored by Ocracoke Alive. 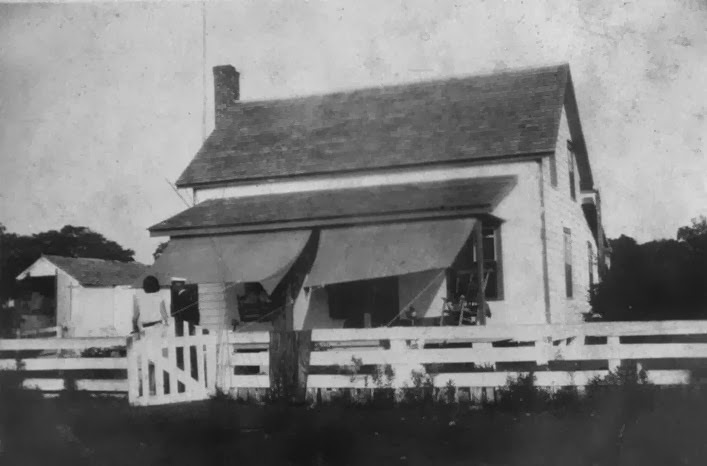 The building in the photo below is now the center section of the Island Inn. Originally built in 1901 as the Odd Fellows Lodge and Schoolhouse, it was converted to a private residence after a new schoolhouse was built in 1917. 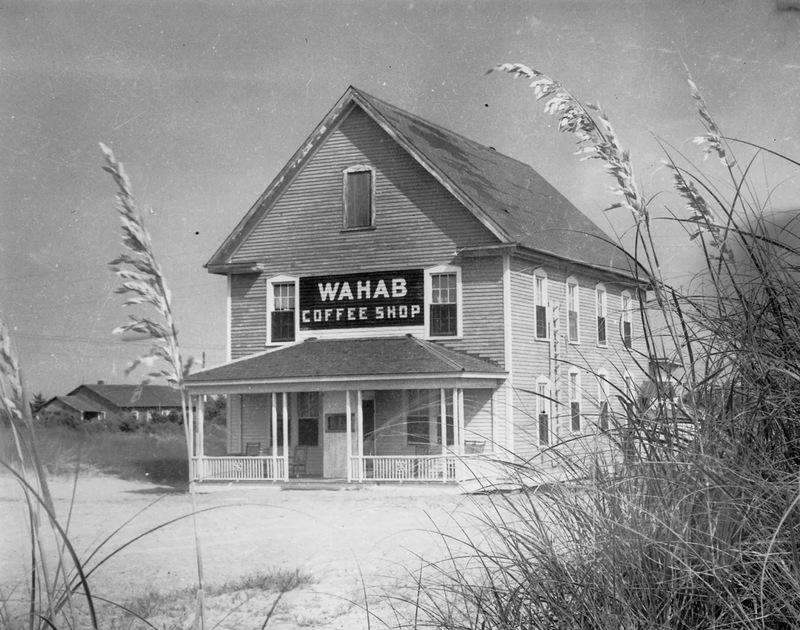 About 1940 island native, Stanley Wahab, bought the structure and used it as a popular island gathering place, the Wahab Coffee Shop. During WWII the upstairs section was made into a Navy Officers Club called the "Crow's Nest." After the war, Stanley moved former Navy barracks to his property, and attached them to the building. He now called his enterprise the Silver Lake Inn. 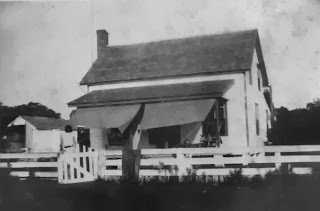 Some years later Doward Brugh purchased the property and re-named it the Island Inn, as it is still called today. Current owners continue to operate the Inn as a popular destination for Ocracoke visitors. This building is identified with a red arrow on the USACE 1939 chart that I published on November 11. Gathering clams in Pamlico Sound is a popular activity. It's fun, it's relaxing...and it provides delicious, fresh seafood for the dinner table. I was intrigued by a news article I ran across a few days ago. Apparently scientists have discovered an ocean quahog, Arctica islandica, that was 507 years old (it was only after they opened it, and therefore killed it, that they realized how old it was!). Take a look at the photo of the 507 year old clam in this article, http://sciencenordic.com/new-record-world%E2%80%99s-oldest-animal-507-years-old, and compare it to one of our Pamlico Sound clams, above. I am certainly no expert, but that Pamlico Sound clam has a lot of rings also, and I think it's only a few years old. Visitors to the island often ask about "the best place to find seashells." And it's always difficult to give a satisfactory answer. "After a storm," is probably the best advice. Or "at low tide." Or "on one of the more secluded sections of the beach." "In the off-season," is another honest answer to the question. 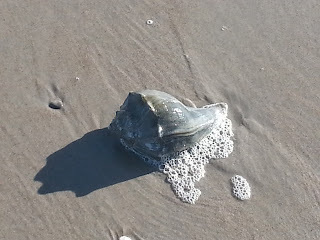 A few days ago I was taking my daily afternoon walk when I spotted this whelk that had just washed up on the beach. Ocracokers would call this a left handed whelk. To find out why, click here: http://villagecraftsmen.blogspot.com/2010/06/shell-dippers.html. Tuesday evening's program after our Ocracoke Preservation Society fall membership meeting was a delightful showing of vintage island photographs that OPS has been digitizing and cataloging. As the images were projected onto the screen old timers identified the people, and shared stories about island life and interesting characters. Unfortunately, no one present could identify this individual. However, I remember well having an identical bathtub when I was a youngster! After the meeting I visited with Barry & Karen who moved to the island recently. I commented that they were good sports to sit through an hour of old photos even though they didn't know any of the people in the images. "Oh, we thoroughly enjoyed seeing the pictures," Barry said. "But the most interesting part of the evening was that you all identified the people only by their first names. 'Oh, that is Elizabeth'...and 'there is Wahab'...and 'that must be Oscar; you can tell by his sailor hat'...and 'that's Lindsey on the horse,'...and everyone knew who you were talking about. No last names necessary." I guess that's one of the appeals of living in a small, close knit community. And something that appeals to folks like Barry & Karen. When we parted I realized I didn't have any idea what Barry & Karen's last names were! I woke up yesterday morning to wind and cold. I don't think it was blowing as hard as had been forecast, but the temperature was just 39 degrees. By noon it was only in the mid forties. But it was bright and clear...a great day for a walk along the surf. When I stepped out onto the beach and headed north (I was walking right into the wind) I noticed a man not so very far ahead of me. He was wearing a light jacket, thin pants, and no gloves. I was bundled up in a shirt, sweatshirt, liner jacket, windbreaker, and gloves. I was taken aback when I realized he was cavalierly splashing through the incoming tide. After about a mile I caught up with him and commented that he was a braver man than I. His pants were wet up to his knees. 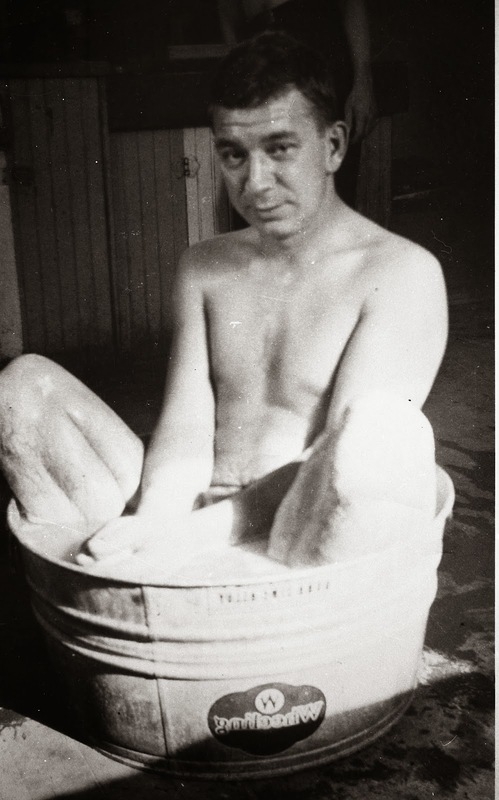 He just laughed and shrugged his shoulders as if it were the most natural thing in the world to splash about in the ocean on a cold day in November. He was definitely enjoying his walk on the beach. When I turned around, with the wind at my back, I removed my windbreaker and liner jacket. By then it seemed warm, even to me. This photo shows my house, the Bragg-Howard House, as it looked in the early 1930s. This house is identified by the green arrow on the 1939 chart I posted on November 11. You can read about the 2004/2005 rehabilitation of the house here. Yesterday's post included an image of the USACE 1939 chart of Silver Lake Harbor. 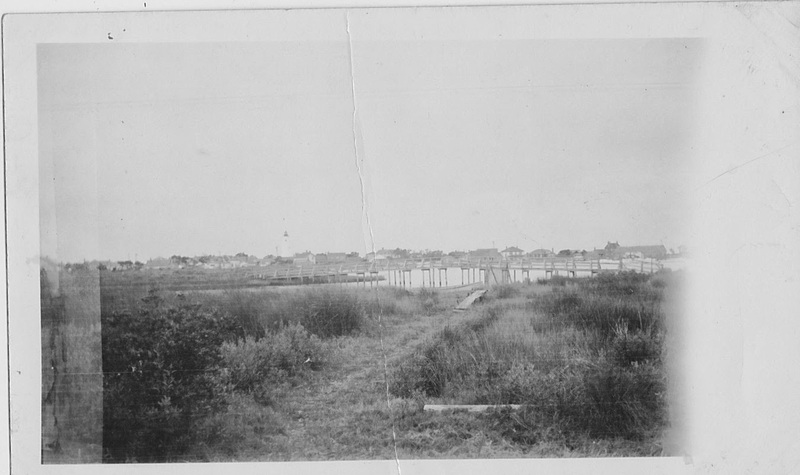 The blue arrow pointed to one of the wooden foot bridges that crossed the "guts" on the SE side of the harbor. This photo of that bridge was taken sometime in the 1930s by my father or my mother. You can enlarge the photo for a better quality image by following the directions on the right. Several days ago, as I was visiting with my cousin Juanita and her family, I laid on my kitchen table a US Army Corps of Engineers chart of Silver Lake made in 1939, soon after the harbor was dredged. There are a number of interesting features to note. The depth in the center of the harbor varied from about 2 feet to 5 feet, with most readings around 3.5 feet. My father often commented that when he was a child he could walk across the Creek (as the harbor is still known by natives today) without getting his chin wet. Limited dredging shortly before this chart was made increased the depth to between 5 and 11 feet in the "ditch" and leading up to the Coast Guard Station. At the top of the chart, on Pamlico Sound and to the NW of the harbor, is the C.G. (Coast Guard) cupola. This is the old station that was torn down after WWII. 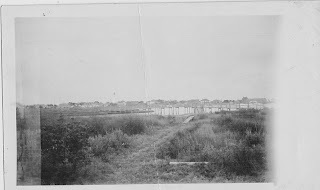 It was behind the current station (now the NCCAT building). Blue -- One of the Bridges over the "Guts"
Be sure to come out to Deepwater Theater (an earlier version of this post mistakenly said the Community Center) on Tuesday evening (Nov. 12) at 6 o'clock for the fall membership meeting & potluck dinner of the Ocracoke Preservation Society. This past year OPS received grants to purchase equipment and hire personnel to digitize vintage photographs in the museum's collections. On Tuesday, after dinner and a brief meeting, the staff of OPS will present a Power Point presentation of many of these old pictures, like the one here of Aliph Howard, Enoch Howard, and Mary Howard, taken in the 1950s. If you have Ocracoke photos in your personal collection, contact OPS. They want to protect, preserve, and digitize as many old photos as possible. They will return your original images along with the digital files...and two other digital files will be retained by OPS (one at the museum, and another as backup in the "cloud"). Wednesday's post was about the dredge Merritt. It reminded me of the Lehigh. Visitors to Ocracoke on the Swan Quarter or Cedar Island ferries often wonder about the two large objects protruding from the edge of the ferry channel not far from Ocracoke. These are spuds attached to the sunken dredge, Lehigh. You can read more in a post I published a year ago: http://villagecraftsmen.blogspot.com/2012/10/the-lehigh.html. Tomorrow the Ocracoke United Methodist Women will be hosting a Christmas Market and Silent Auction at the Methodist Church Rec Hall beginning at 10 am. Earlier this morning I posted outdated information about the Market. You can read accurate information here: http://www.ocracokecurrent.com/76551. My apologies for the mistake. A public ceremony honoring and recognizing our community's servicemen and servicewomen will be held tomorrow, Friday, November 8, 2013, at 8:30 a.m. at the school circle. The public is welcome and encouraged to attend along with all servicemen and women. The official Veterans Day is Monday, November 11. 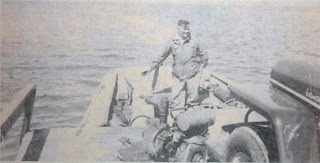 You can read more about the history of Veterans Day here: http://www.va.gov/opa/vetsday/vetdayhistory.asp. The US Army Corps of Engineers dredge, Merritt, has been working for months deepening ferry channels around Ocracoke. The Merritt is a side discharge dredge. Other types of dredges commonly working in our coastal waters include pipeline dredges (they pump the discharge through pipes to a remote location), and hopper dredges (they pump their discharge into an on-board hopper, then dump their load in deeper water at some distance from the channel). This photo of members of the Ocracoke Needle and Thread Club was taken several years ago. The ladies were working on a traditional Ocracoke Island "cracker quilt." Earlier this year I published a blog post about the origin of this pattern. If you missed it you can read it here: http://villagecraftsmen.blogspot.com/2013/03/cracker-quilt.html. The Needle and Thread Club continues to meet regularly on the island. 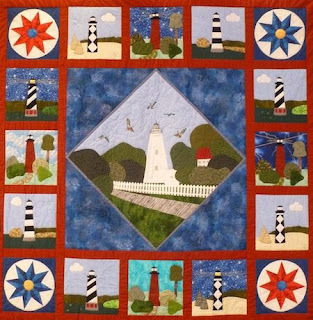 Every year they donate a beautiful quilt to the Ocracoke Preservation Society for their annual raffle. Click on the photo below (this year's quilt) for more information about how to enter to win. But hurry, this year's quilt raffle drawing will take place December 10 at the OPS Community Wassail Party. Several days ago I received the following email from Barbara Garrity-Blake, a prominent North Carolina cultural anthropologist. Together with Susan West, a coastal journalist, Barbara has been working on an Outer Banks Oral History Project. Barbara and Susan are both highly trained and dedicated individuals. Barbara's email explains how you can help. We have already completed Phase I of the project, including training people in the community on interviewing and digital recording techniques for oral history collection. Phase 2, where folks actually get out there and collect/transcribe oral histories of NC fishermen, boat builders, net makers, etc. and put together an online exhibit, was slated to begin Oct 1 pending funding from the National Park Service. Well, for the 2nd year in a row, funding got sidelined by Congressional budget battles. Are we going to let that stop us? Heck no! Too many people have stepped up to be part of this project! And there are so many compelling stories to share. So we are turning to YOU to help us raise the funds to work this winter and have an exhibit on NC maritime life online by late spring/early summer 2014. Here's how Kickstarter works: we have until Nov. 25 to meet our goal of $8,400 in pledges. Pledges can range from $1 up. Go to our site and see the great REWARDS you receive depending on your pledge. If we don't meet the goal, you are out nothing. If we DO meet our goal, you get your rewards PLUS the reward of knowing you helped Outer Banks and Down East communities tell their story, their way. Yesterday I mentioned David & Penelope Carroll's Blackbeard trilogy, Thatcher. 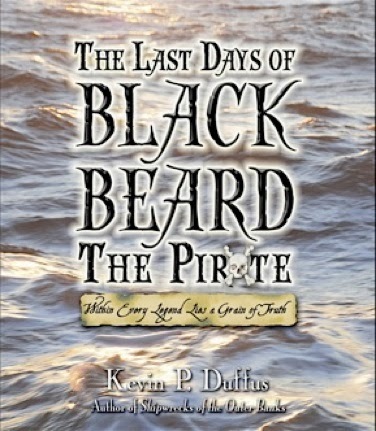 Today I will share information about Kevin Duffus' 2008 book, The Last Days of Black Beard the Pirate. Kevin Duffus has done extensive research on the life of "Edward Thatch," research that leads to the conclusion that much of conventional "wisdom" about this most notorious of pirates is wrong. 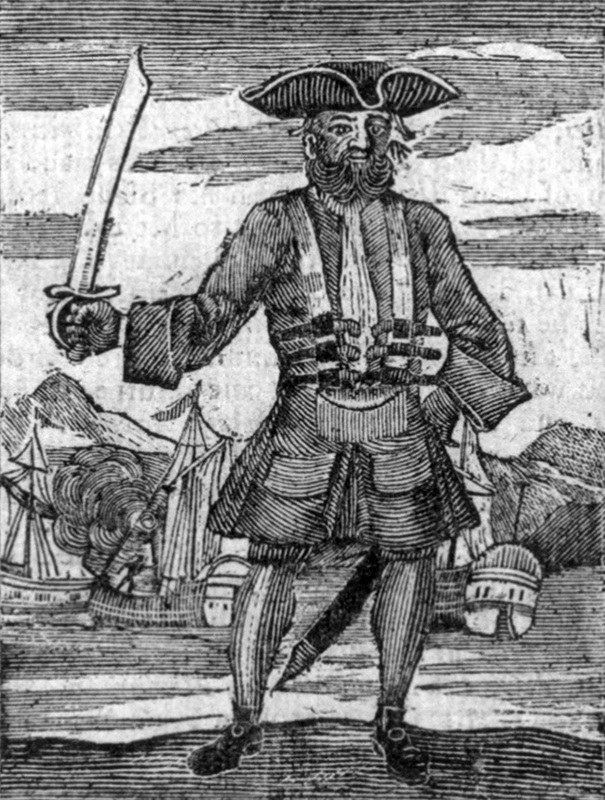 Duffus writes that "[h]istory remembers the infamous Black Beard as one of the greatest, most successful pirates who ever lived—a paragon of pirates. But what if history got it wrong?" He claims that "many historical accounts describing the pirate’s last days—the six months following the wreck of the Queen Anne’s Revenge at Beaufort Inlet—were inaccurate, insufficiently researched, and, as it turned out, not nearly as interesting as the truth. For more information about Kevin Duffus' book (including the fascinating claim that the famous pirate's real name was Edward Beard, son of Gov. Charles Eden's neighbor Capt. James Beard) click on this link: http://lookingglassproductions.org/LookingGlass2008/LastDaysofBlackBeard.html. 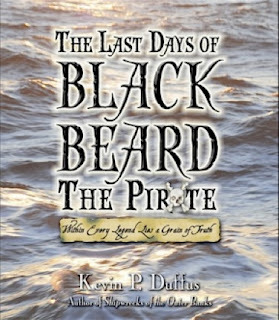 Kevin Duffus' book, which is richly illustrated with full color photographs, is a "must read" for anyone interested in the true story of Black Beard the pirate. During the recent Pirate Jamboree I met David & Penelope Carroll, authors of Thatcher, The Unauthorized Biography of Blackbeard the Pirate. The Carrolls describe their endeavor as "a work of historical fiction in three volumes." I don't remember David's exact words, but he wanted me to know that, unlike some other authors (those who insist on documenting Blackbeard's life from primary historical records), the Carrolls enjoy incorporating every story, legend, tale, and embellishment into their biography. Their free bookmarks include this teaser: "For eighteen months, one man terrorized America, bringing commerce and a superpower to its knees, raging onto the scene and disappearing as mysteriously as he appeared, yet no one knew who he was except for the moniker...Blackbeard. Until now." The Carrolls' website proclaims that their trilogy, "weaves the acknowledged facts of Blackbeard's life into the historic machinations that led to today's world." Volumes one and two are currently available. Look for volume three at a future date. You can read more on their website: http://www.thatcherthebook.com/aboutthetrilogy.html. More news about Blackbeard appeared two days ago. According to various reports, five 2,000 to 3,000 pound cannons were recently brought to the surface from the nearly 300 year old submerged wreck of the Queen Anne's Revenge, Blackbeard's flagship. The cannons fired 6-pound cannonballs.